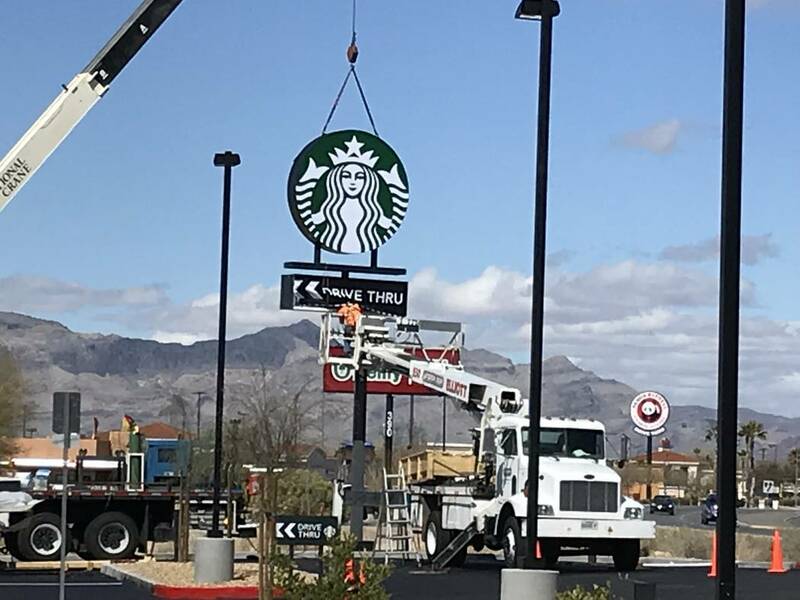 Terri Meehan/Special to the Pahrump Valley Times A sign was raised at the new Starbucks location under construction in Pahrump on March 7, 2019. According to a small sign in front of the future coffeehouse at 460 S. Highway 160, the location is set to open March 25. 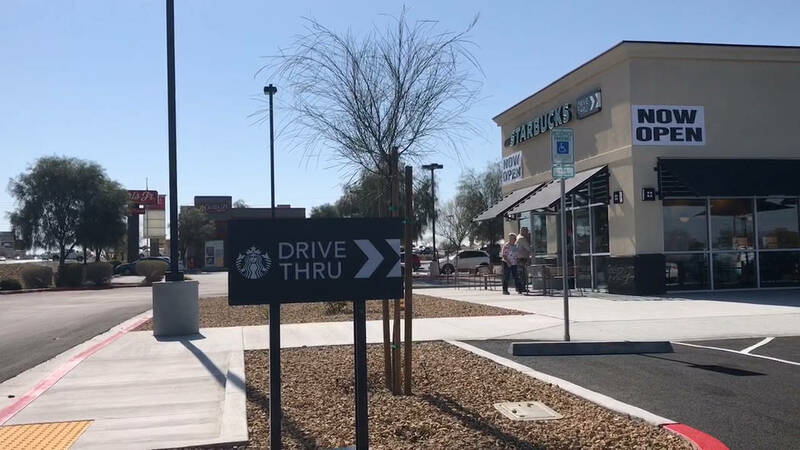 Jeffrey Meehan/Pahrump Valley Times Pahrump's first drive-thru Starbucks location in Pahrump debuted on March 25, 2019. Motorists made their way through the drive-thru line and some took to setting up at one of several tables to eat or drink at. Jeffrey Meehan/Pahrump Valley Times Pahrump's newest Starbucks location opened at 460 S. Highway 160 on March 25, 2015. Construction began at the end of 2018. Terri Meehan/Special to the Pahrump Valley Times Pictured is Pahrump's newest Starbucks location before the location opened in town. 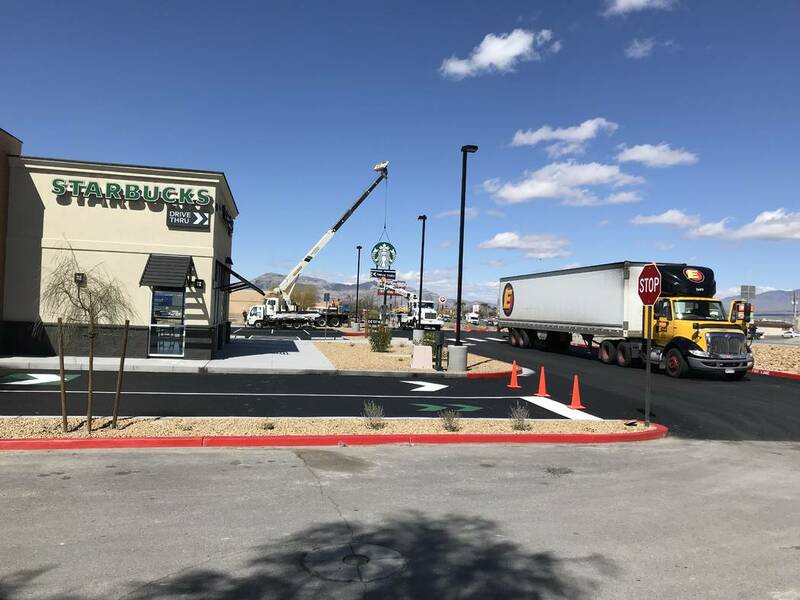 The new Starbucks is the second in town; th A new Starbucks at 460 S. Highway 160 is set to open its doors on March 25, 2019, according to signage in front of the under construction coffeehouse Construction began in 2018 at the site of the former Java Junkies location. Pahrump’s new, roughly 2,200-square-foot Starbucks coffeehouse, opened on Monday to locals and tourists traveling through. The new location sits at 460 S. Highway 160, just south of the retail center that houses Walmart, along the highway. This is the second Starbucks in the Pahrump area, though the first corporate location for Pahrump. 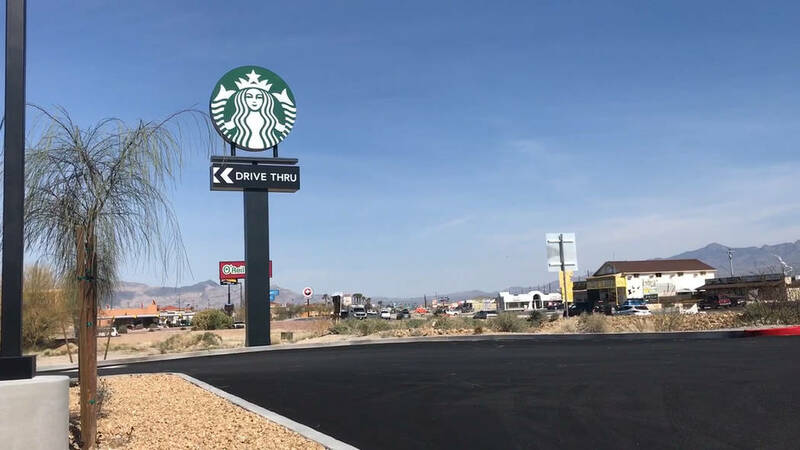 It’s also the first drive-thru location for Starbucks in the Pahrump area. Seattle, Washington-based Starbucks’ press office could not be reached for comment on the opening. Construction began in the fall of 2018 with major progress becoming noticeable by the end of last year. A large sign emblazoned with the Starbucks’ trademark on both sides was raised on March 7 at the former site of Java Junkies. Property records with the Nye County Recorder’s Office show a deed transfer in August 2018 from prior owner Mary W. Zell, trustee of the Zell Family Trust, of 440 and 460 S. Highway 160, to Highway 160-Pure LLC, a company held by Austin, Texas-based Pure Partners for $610,000. On Pure’s website, the company stated it has done several build-to-suit developments for Starbucks Corp. and other national tenants in Las Vegas and multiple states across the U.S.
An additional document in the recorder’s office shows a memorandum of lease between the landlord, Highway 160-Pure LLC, and Starbucks Corp., the tenant. The lease terms consist of a 10-year initial period with options for Starbucks on future terms, according to the documents. The lease covers the 2,200-square-foot commercial property at 440 and 460 S. Highway 160 in Pahrump, according to property records. The general contractor on the project was KC Maintenance Inc., according to signage at the site. According to Starbucks’ fiscal 2019 first quarter results (period ending Dec. 30, 2018), the company opened 541 net new stores across all segments (regions) it has holdings in during the first quarter, globally. Half of the new stores were licensed locations with two-thirds of the openings occurring outside the U.S., according to Starbucks’ financial results from its fiscal first quarter. The 541 net new stores gave Starbucks a 7 percent increase in its footprint across the globe over the prior year. The company had 29,865 stores at the end of the first quarter for fiscal year 2019.